Reports have been coming in the past week--very exciting reports. It looks like White Winged Crossbills are going to have a big year in New York...they are being seen in roving bands all over the Adirondacks, and all the way down to Pharsalia (near Ithaca). According to Matt Young, crossbill expert, the birds are gathering now and may nest in the state later this year. Like Red Crossbills, they use their specialized bills to feed on the pinecone seeds, and so their presence is connected to the boom/bust cycles of that cone crop. Often, the White Winged Crossbill is a very rare bird in NY State, but this year it looks like the exception. This caps what has been an excellent year so far for the winter finches, and it's the last winter finch to see on my list. No surprise, then, that I spent three days last week up around Ferd's Bog in the Adirondacks, looking for both the White Wings and trying again for the Three Toed Woodpecker. I drove up in the afternoon, and immediately went for a drive on the backwoods Moose River Plains Road, where a lot of WW Crossbills had been seen the week before. 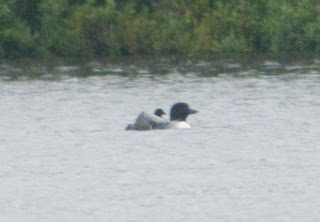 The first 24 hours I was there it was either drizzling or raining, which wasn't a help, and although I saw a pair of Common Loons with a chick riding on it's mother's back, I missed the crossbills. Moving on, I slept in my car at Ferd's Bog, and walked in at 5am, hoping to hear or see the elusive Three-Toed Woodpecker that has been seen there recently. Since there seems to be just one female bird there right now, it's not a certain proposition by any means (this is the fourth time I've been there to look for it). 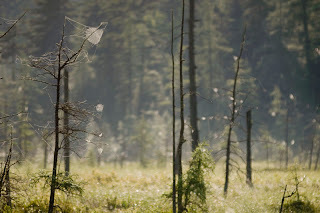 Three-Toes, I'm told, can also be notoriously silent, and seeing her in the tangle of deadfalls around the bog is a difficult trick and involves some luck. Of course, the longer you spend looking the luckier you tend to get, so I put in three hours that morning. Nothing but beautiful habitat and a few other bog birds, so I headed out to Moose River Plains Road again. Unfortunately, my luck stayed the same, and although I did get a good look at a nesting Lincoln's Sparrow, as well as Magnolia and Blackburnian Warblers, I didn't have any crossbills. Crossbills can be hard to see because of their nomadic, unpredictable behavior--they seem to rarely stay put--which is sort of the opposite problem as the Three Toed Woodpecker, who I know is in Ferds Bog, but is reclusive. The weather cleared towards the end of the day, so I was hopeful for a better chance the next day before I headed home. I slept at Ferd's again, and was in the woods at about 5:30am. In this situation the call is as likely as seeing the bird, so I had my recorder running in 5 minute segments the entire time. 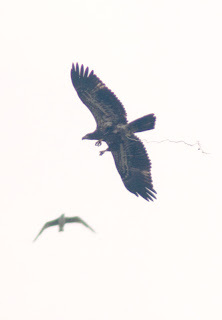 I had just heard a soft call that I thought might be Three Toed, when I heard a chatter overhead. I pointed the microphone up at the same time, and realized that I had a group of WW Crossbills flying over! That lasted a few seconds, and then I had the woodpecker call again, which I also recorded. 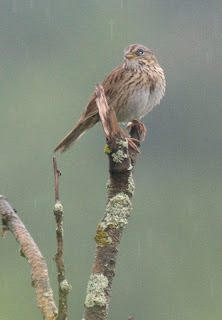 I was a uncertain about the quality of the recordings, but I was glad to have had a little luck, and headed home. Back in Brooklyn I isolated the calls and amplified them, and sent them out to Matt Young and Tom Stephenson for their opinion. Unfortunately, the woodpecker call was faint, and I'm afraid it's not conclusive enough to count (the call is similar in quality to a Pileated Woodpecker, and although this was a soft call and I'm pretty condfident was a Three Toed, I don't think the recording is definitive). The crossbill call, though, was definitely White Winged Crossbill, which is a great addition to the year list. I have three "silver bullets" this year in the form of frequent flyer airline tickets. I've been saving them for rarities that might show up upstate, so that I can get up there quickly and save the 14 hour round-trip drive to Niagara Falls or Dunkirk Harbor. Two days ago a Franklin's Gull showed up in Dunkirk Harbor...I couldn't do the drive because of business. Franklins has only been showing up every two or three years lately, so I figured it was time to fly. I got my tickets and was at the airport with my gear for my 8am flight (the earliest I could get)...by 10:30 I was in Dunkirk, at the same spot the gull had been seen. I only had about 3 hours to look, but I figured that if the gull were there it was there and that would be enough time to see it. The beach where the gull had been seen was covered with gulls, but no Franklins. I scoped the adjascent beach...nothing. I worked the stone breakwater with the scope from several angles, and though there were some Caspian Terns and Great Blue Herons, I couldn't see any hooded gulls. 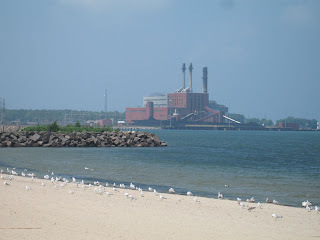 I checked the harbor, where there were a number gulls again, but once more no Franklins. 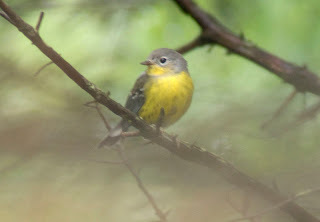 I ran into several other people looking and no one had seen it, and I called some upstate birders who hadn't heard of any sightings that day either. Looked like I missed it. I finished my allotted time back at the original spot, and had a Bald Eagle soar over and spook off all the birds. That seemed to be my cue, and I was back in NYC by 5:30. I had a business meeting, and got home around 9. Checking my email, I saw a post that in fact the Franklins had been seen, both in the early morning and again at 5pm. If I had just had a little more time, I would have seen it for sure. There have been no reports of it so far today, so now it may really be gone. So in short, my first silver bullet was a miss. A cattle egret was seen near Lake Cayuga associating with some cattle yesterday, and I figured to get a few species at once and chase that bird at the same time. Cattle Egrets are seen each year at Jamaica Bay, but I figured the bird-in-the-hand approach was best, and combined with the other targets I could make a little more progress in the year. The egret was spotted at the home of a veteranarian, whose wife initially saw the bird hanging out with their cows. 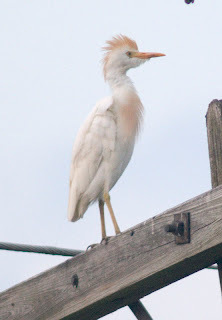 Cattle Egret are common in the south, but are pretty uncommon in NY...they look a little like Snowy Egret, but with a yellow crown, breast and bill, and an overall stockier appearance. They associate with cattle and eat the insects that the cows stir up. I left Brooklyn around 2pm, planning on getting to the spot by 7, but then hit an hour-long, construction-fueled traffic jam. I pushed on as fast as I felt was safe, and go t to the house at around 7:45, as the sun was beginning to set. I was afraid I was too late, and at first the bird was difficult to see...it was in the back of their pasture in some tall grass, and I was staying on the road in order not to trespass or disturb the owners. 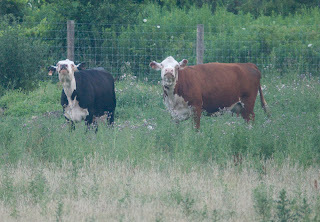 After a few worried minutes I spotted a white something by the cattle, and there it was. I got a few blurry and distant but recognizable photos and was getting ready to go, when the owner returned home. He and his wife were very gracious and invited me onto their deck for a better view...just around then the egret soared up (I got some flight shots), and then perched on a telephone pole and posed for some nice portraits and satisfying looks. I stayed in Ithica and got up at 3:45am the next morning to look for Red Crossbill in Pharsalia. Crossbill expert Matt Young had given me a lot of great advice, and I went to a spot he had recommended. 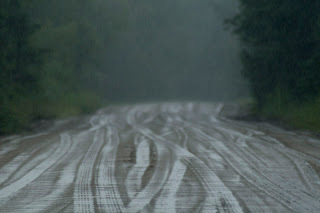 It's a road that I had been to in the winter several times, looking for that same bird without luck. This time, though, I heard the birds fairly quickly, and for the first hour of daylight heard four or five separate birds and was able to make a recording of one. I sent the recording to Matt later that day and he confirmed it, and thinks it might have been a Type 4, which would be less common for that area. [Crossbills are currently broken into 9 groups, types 1 through 9, and may at some point be split into several separate species]. I was planning on going on for more birds (I still need a photo or recording of that Black Billed Cuckoo! ), but had a change in my work schedule and had to come back early. Nonetheless, as I've learned many times this year, no chase is a guarantee, and two new birds is a good result. 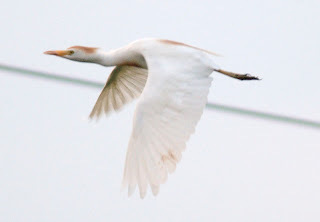 In fact, people looked for the Cattle Egret the next day and didn't see it...it's gone off to some other place and may never be seen again. 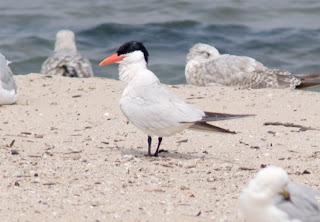 I've been spending a good part of my birding time on Long Island lately...it's the place to be for Terns and other sea birds. The sea watches have been good, and I've seen all the expected species for this time of year by watching from the shore. What I haven't done is gotten photos of most of them, because they are often a mile or two out and moving fast. Since there are no official pelagic birding trips between February and August in NY, I decided to improvise and go out on a party fishing boat. These boats are probably the cheapest way to get out on the water...$60 for a full day...and if you go on a weekday they are not particularly crowded. 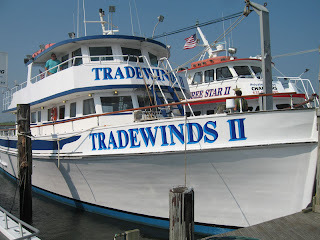 I went on the Trade Winds II out of the Captree marina, aftering reading a post on the NY Birding messsage boards by John Gluth who had a good experience. The captain, Paul Risi, is very friendly and also very interested in birds, and he was extremely obliging. The boat is 78' long and can carry several dozen people, but today it was about 15 fisherman and me, plus a couple of mates and the captains dog Duke. The fisherman all fish from the lower deck, so apart from a seasick passenger or two I had the upper decks to myself . I used to get seasick a lot as a teenager, so now I use a prescription patch called Scopoderm (scopolomine) which keeps me barf-free. There was a five foot swell due to hurricane Bertha, but it was manageable. Shooting flying birds from a rolling boat is challenging and I enjoy it, but its another reason to be diligent with sea-sickness meds. Keeping your eye in a telephoto lens while the boat pitches and rolls amplifies the whole experience. Within a few minutes of getting to sea we had a Greater Shearwater come in, and I got a few shots as it cruised stiff-winged past the boat. The shearwaters all have a distinctive flight, using the micro-winds created by the waves to glide just a few feet above the water. I was excited to have one close in. 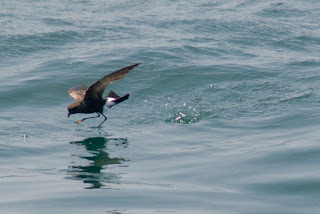 The next bird was a black, sparrow-sized creature flitting above the water...Wilson's Storm Petrel. These birds are often seen in rafts of several hundred, but today I saw twenty in ones and twos. I was hoping to see their feeding behavior...they patter their feet on the water while hovering just a couple of inches above the surface. Sure enough, when we got a little further out I saw various Storm Petrels do just that. The boat made numerous stops and starts, moving to different fishing spots, and along the way we also had a number of Corey's Shearwaters fly by. 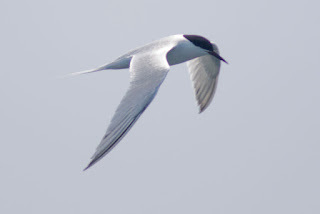 We built up a fair number of terns around the boat when some bait was being tossed over, and I was hoping a Parasitic Jaeger might drop in to hassle them for food. No Jaeger, but I did have a Roseate Tern briefly join the raucous Common Terns. Overall it was a great day, and I added three new photos to my collection. 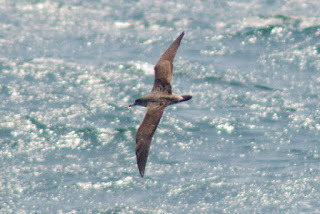 I had two Greater Shearwaters, about twenty each of Coreys Shearwaters and Wilsons Storm Petrel, and one Roseate Tern. At this point I've photographed or made an audio recording of every bird except Black Billed Cuckoo, which I heard but didn't record. I'm hoping to keep it up for the rest of the year...it'll be a great collection to look back on and remember this big year.